Teens can accomplish more with their phones in an hour than most people can accomplish in a week. However, while technology moves us forward, basic life skills are slowly fading into the background. Facebook, Twitter, and Snapchat, along with other social media tools, make it so easy for teens to interact with people from the comfort of their homes that in-person job interviews or public speaking tasks seem daunting. And with banking apps to help manage our finances, it’s easy to see why many young people don’t know how to write a check or balance a checkbook. Still, basic life skills, which include managing a bank account, writing a resume, or understanding how a paycheck works, are as important today as they were 20 years ago. Knowing driving laws plays a big role when it comes to driving safely. Being a defensive driver – doing everything to avoid an accident – is also essential when on the roads. Once teens get a driver’s license, it is imperative that they stay within legal speed limits, obey the rules of the road, and keep their seat belts on at all times. The Driving and Safety worksheet is a great reminder that driving correctly isn’t only important for the driver and his passengers, but for all of the motorists on the road. It’s not difficult to open a bank account, but it isn’t always easy to maintain one. Our Understanding Checks and Bank Accounts worksheet covers what teens need to know in order to manage their money in high school and beyond. It touches on understanding the difference between a checking and savings account, discovering how interest works, learning how to withdraw and deposit money, and keeping a checkbook up to date. Teens may not realize that balancing a checkbook isn’t always easy — it takes discipline and time. While teenagers have seen parents or other adults write checks, many do not know how to write one out on their own. It’s important for teenagers with checking accounts to know how the process works. The Understanding Checks and Bank Accounts worksheet refers to important details, such as filling out a check, where to find the routing, account, and check numbers, and where to sign a check. A resume is a summary of work experience, skills, and education, and can be utilized even if an applicant doesn’t have much of a work history. Help Teaching’s Resumes and Cover Letters worksheet addresses what type of content is needed to make a good impression on a potential employer. Items such as professional quality, easy to read content, and error-free grammar and spelling are a must. It also touches on the need for cover letters to be tailored to each job application, rather than a one-size-fits-all approach. Finding the right job takes time, knowledge of labor laws, and some detective work. This process can be frustrating for anyone, but our worksheet The Job Search provides tips and guidance on how to proceed. Items such as networking, when to apply, what jobs to apply for, and age limits are covered. Job applications are generally used for all places of employment. Deciding what information to have on hand, or knowing what should be filled out on the application can be daunting to someone just starting the job search. The Filling Out a Job Application worksheet touches on what is important when applying for a job. Employers need easy to remember items such as name, address, and phone numbers, but can also require information not known offhand, like a social security number, emergency contacts, or former supervisors’ information. The worksheet also discusses what to do if there is no work history to include on an application, such as preparing a list of skills that can go a long way to impress a hiring manager. Once the application has been received, a personal interview is the next step. Help Teaching’s Life Skills worksheet The Job Interview recognizes how intimidating it can be to meet with a potential employer. It can be difficult think quickly when nervous, or to answer questions on the spot, so it is wise to be prepared before going in the interview room. First impressions are key and things like being on time, what kind of clothing is worn, and overall demeanor can be the defining factors in getting the job or being passed over. Knowing what skills are outstanding, what skills need improved, and having questions ready for the hiring manager will make a positive impression. Once a job is obtained, our website’s worksheet Paychecks and Taxes can help guide employees through the ins and outs of deductions and taxes. For teenagers and young adults, often the number on that eagerly awaited first paycheck is not nearly as high as had hoped. This worksheet discusses 401 K, the difference between net and gross pay, overtime, and benefits on a paycheck. It also introduces topics such as tax forms, dependents, Social Security, and Medicare. When that paycheck begins to come regularly, a credit card may be desired. Without out the right knowledge, it’s easy to fall into credit card debt. Anyone under the age of 21 must have a co-signer to obtain a credit card, unless they can prove they have a five-figure income. Our worksheet Understanding Credit Cards discusses how credit cards work and how to manage them. It refers to credit scores, credit history, and payments, along with APR and interest fees. 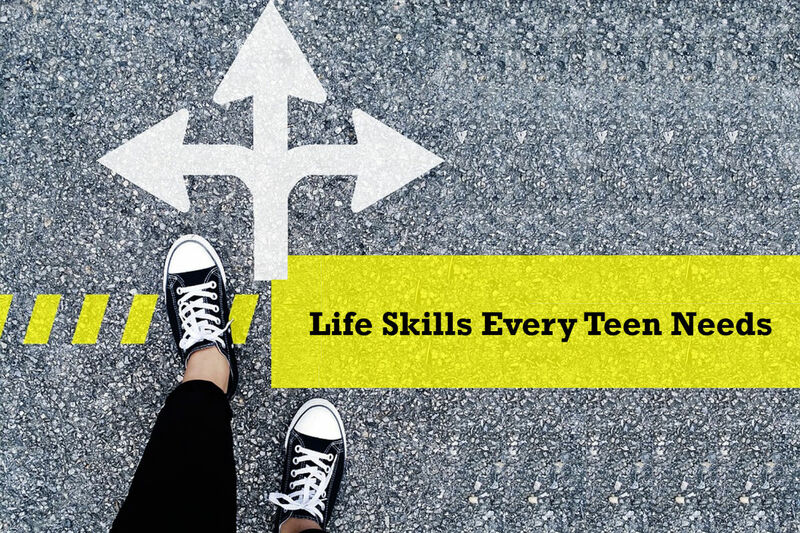 The amount of knowledge teens and young adults have with basic life skills is often taken for granted. As a result, many go out into the real world not knowing how to write a check, use a credit card wisely, or even remember basic driving skills. Teachers can use the Life Skills worksheets in any high school or higher grade level. Some worksheets such as Understanding Checks Bank Accounts can be used for early high school, and even middle school. Find more life skills worksheets at HelpTeaching.com. So I believe every teen should be taught the basics of parenting and the science of child development… The latest research and caring for young children. Even if they don’t want to have a child they may change their mind or have an unplanned one. I am always surprised at how little people know and it is information that is esencial to society in general! Sorry, but do people still write checks? I’m 42 and have not written one fir over a year. Everything can be done online or witha phone. all the time. for various things. most of what i do is on line, but you must not have younger kids then? all sorts of school things, all sorts of activities, all sorts of fundraisers, all want money and i might not have it on me at the time. also, writing checks for big birthdays etc. we get checks for holidays and birthdays for the kids. Excellent post! Going to show this to my own teen!